This is the third of eight articles from that interview. In the first article, we discussed the role of the pharmaceutical industry in the current American opiate epidemic. In volume two, we talked about race and how drug policies in the 1980’s with crack are very different than the 21st century policies surrounding opiates. In this third edition, we discuss how Mexican immigrants became some of the key sellers of black tar heroin, does supply or demand lead to bigger drug problems, and we briefly touch upon Donald Trump. Frank Greenagel: I appreciate your giving a contrast between the areas and the nuance of the violence issue. I want to stick with the race, though. You spent a lot of time discussing Mexican immigrants from the town of Xalisco. They are the major traffickers of black tar heroin, so anti-immigranters and Trumpsters would have a field day with that information. How should our drug policy address immigration issues? Sam Quinones: Wow. I don’t know. That’s a good question. It’s possible that they will have a field day with it. My feeling is if I as a reporter, if reporters spent all their time worrying about how certain people might use the stories that they write, they’d never write anything. I just felt like I don’t bind myself that way. Frank Greenagel: You just want to get the information out there. Sam Quinones: I want to tell a story and I want to get the information out and these guys are, they’re not the only ones, but they are among the most important black tar heroin traffickers from Mexico. Particularly, years ago, before everyone figured out the market, they were really important. I’m not sure if I know what to propose with regard to immigration policy. I’ll tell you a couple of things. First of all, we have had a lot of arguments over the years, over the decades, about what comes first. What’s more important in igniting these drug scourges, is it demand or is it supply? My feeling is truthfully that it is supply. Supply creates demand, it’s not the other way around. This one was created by doctors prescribing way too much. Way too much. That massive increase in pills out there, and very, very liberal and aggressive prescribing, and a variety of things like that, all helped create new addicts. They were not addicted before they had an abundant supply available to them of these drugs and constantly having them pushed on them. 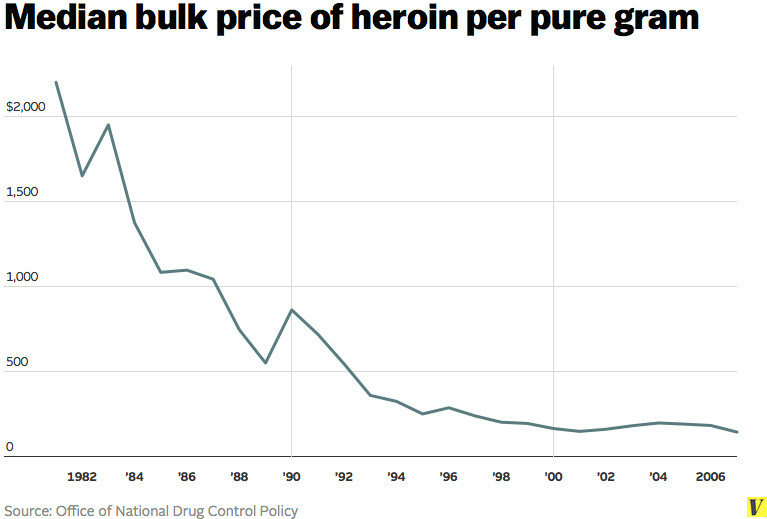 It’s unclear to me that we would have much of a heroin problem if there wasn’t so much heroin splashing around the United States. Think again. My feeling, I’m not sure I had an answer to that question before, but after this, I definitely believe supply helps create demand. Then, demand goes wild. It’s also true with the Colombians and cocaine. We didn’t really have a big market for cocaine until the Colombians in the early 1980s forced all that coke through Miami and into south Florida, etc. Then, of course, there became a demand for it, but they, like all these drug traffickers, like great marketers, understand if you provide it and market it in the right way, you will find that people respond to it. For me, honestly, this latest one starts with doctors, doctors overprescribing way, way, way overprescribing for all kinds of things. You know probably as well as I do, wisdom teeth extraction, minor surgery, all this stuff that you used to get ibuprofen for, now you’re getting basically opiates for. That being the case, we have to keep in mind that traffickers will take this. That’s really what happened. The heroin traffickers follow the market for pills. I think that we need to understand that we have a border … We now have essentially a sealed border. I do a lot of immigration reporting along the border and stuff and I’ve been down to Tijuana several times. I know that city fairly well. Frank Greenagel: That’s what your first couple of books were about, was about Mexico and some of the immigrant and border issues, correct? Sam Quinones: Exactly. My feeling is that the border is sealed. The reason I say that is it now costs an immigrant $6,000-$10,000 depending on where they go and that kind of thing to cross, whereas not so long ago, it was in the $300-$500 range and then it got up to maybe $1,000 or $2,000, which was still fine, but now it’s well beyond a lot of immigrants’ ability to pay. The border is now effectively sealed. However, we have to always keep in mind that we will never really, really be able to seal the border, not if we want to have trade with Mexico. It simply won’t happen. I mean, there will be ways people and substances will leak across so it behooves us to understand that when we are designing new policies and drug policies in particular. When the FDA decides that this is a really good idea to market this stuff and to make this stuff available, they might want to take into consideration that there is going to be a black market in it. I just find it amazing that no one would have thought that. They might have, but they didn’t put enough emphasis on it. Getting back to your original point, I’ve had that question asked to me before and my feeling is that I really don’t care. I like stories not based on whether it makes a certain group look good or bad and I write stories that I think are great, great tales that need to be told that no one’s telling, and that’s what I think I did with this book. You can see my other books and see how that might reflect on Mexico and make your own decisions about the country, but I lived there for 10 years. I didn’t live there because someone put a gun to my head. I love the country, but I’m also not going to shy away when I see a huge story, no matter what Donald Trump or anybody else says or how they might use it. Otherwise, I’d never write a thing.